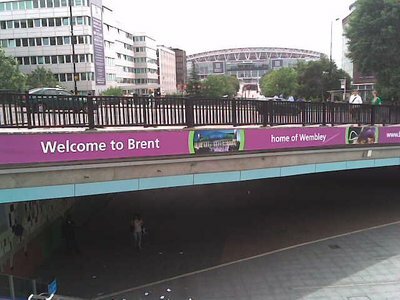 I live in Brent. Now some of you are probably saying, “wait, Greg, I thought you lived in London.” I live in London as well, at least in the Greater London administrative region. London, as most of us would think of it, is in fact one of 33 different cities, Royal Boroughs and Boroughs that make up the Great London area. The “City of London” is just one of these, a smallish bit near the river which contains about half of the interesting touristy-stuff, the other half with the interesting touristy bits being in the city of Westminster. So my saying I live in Brent and I live in London is a little like how someone from New York can claim to live in Manhattan and in New York. Well, perhaps not Manhattan, given Brent’s outer borough status - maybe it would be more like someone saying they live in Staten Island and New York City. As a “marketing professional” (at least in my previous job), I do take some interest in marketing stories when they appear in the news, doubly so if they are about something of interest to me. I am always interested in marketing stories that deal with travel and tourism, given my love of travel. That’s why I was interested to read recently that the Brent Council is thinking of changing the name of the borough. Brent is named after the Brent River which runs through the borough, but the council feels that there is a more important landmark that the place should be named after. That thing is Wembley Stadium. Wembley is a 90,000 seat stadium, which means that in my New York analogy I would probably be better off saying that I live in Rutherford, home to Giants Stadium, home of both the NY Jet and NY Giant's football teams. The Giants, last year's Superbowl Champion, who played in Wembley during week 8 game of the 2007 season, facing off and winning against the Miami Dolphins. The Giants went on to win the Superbowl (the ultimate trophy in American football). 2008 sees the NFL returning to Wembley, with the New Orleans Saints set to take on the San Diego Chargers. San Diego is right now at 8 to 1 to win the Superbowl, behind only the New England Patriots, Indiana Colts and Dallas Cowboys, so it looks like the gambling world has picked up on something - teams that play and win and Wembley are likely to win the Superbowl. Hey, so far it's 1 for 1. (Note, this is based on one online book at time of writing, odds change all the time and it depends on who you bet with, so don't take anything here as advice or anything else that could, in some way, wind me up being libel for your gambling losses). 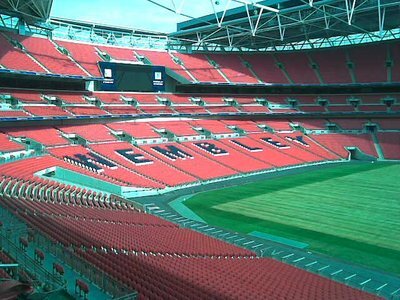 Wembley is around the 20th largest stadium in the world. May Day Stadium in North Korea is in first place, by the way, with a reported seating capacity of 150,000. But unlike Wembley which sells tickets to willing participants, the North Koreans probably don't have a choice when they come out to watch Kim Jong-il's Karoke Night of Stars! 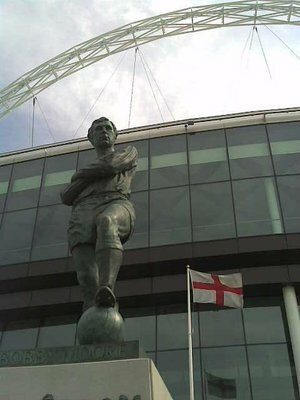 Wembley is best known here in England as the home of the English national football team, and the stadium (not this specific incarnation of the stadium, but the previous one) was the site for England's only World Cup victory back in 1966, lead by captain Bobby Moore, who is immortalized outside the stadium with a statue. For those from outside England, Wembley is probably best known as a concert venue. 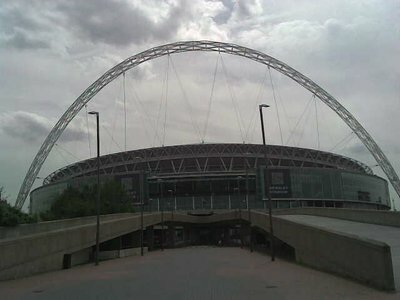 It held one of the many Live Earth concerts in 2007, twining it with the previous Wembley Stadium, which was one of the venues for 1985's Live Aid Concert. Why risk the anger of the residents of the borough on the expense of changing all the street signs and potentially alienating residents in areas not in the area of Wembley? To increase overnight visitors and tourist share of wallet, of course. Tourism is huge business now, and places are always looking for any edge get people to come a little sooner, spend a little more and stay a little longer. I’m neither for or against the move. I see the potential of a tourism pitch from the council of Wembley to come to the Borough of Wembley, but think they could probably accomplish that without having to spend millions of pounds to change all the street signs. What this story did do, though, is got me thinking about how cities which do get a lot of visitors, like Paris, New York or Tokyo probably didn’t take into account overnight visitors or share of wallet when naming there cities. B.C. 753. Romulus is standing atop Palatine hill, watching the work unfold on his grand city. His brother, Remus, enraged and saddened that Romulus is to be king, leaps over a trench meant to fortify the city, embarrassing Romulus by suggesting that his city is easily breached. Romulus, enraged slays his twin brother, declaring , “So perish every one that shall hereafter leap over my wall!” Sadly from Roman citizens some 800 years later, this incantation didn’t apply to the Visigoths, but that’s still a ways away. Romulus turned to see Innuo and Acquiesco, the two “marketing gurus” his brother Remus had made them hire. Romulus rolled his eyes. “What it is?” he asked. Romulus would have slew them on the spot if it wasn’t for the fact they had an iron-clad contract that paid them double in the event that they were run through with a Gladius while on the job. There lawyer, Lex Legis was famous for his posthumous contract clauses. “...like with the Sabines,” Acquieso proffered, scrunching up his face to show distaste. Romulus sighed, staring at the heavens. “Is this some kind of revenge, brother? Are you already among the gods toying with my fate?” he thought. “Yes, they find feel that a city named after the King will be more focused on the King’s needs, and not so much on theirs as potential citizens or visitors,” said Innuo. Romulus started to pull out his sword. Innuo put up his hands, “hey, we are brainstorming here. There are no bad ideas. Criticism, especially of the fatal kind, is not allowed in brainstorming sessions.” Romulus, confused, let his sword slip back into it’s sheath. Romulus, Innuo and Acquieso brainstormed late into the night, and that my friends is how the the Eternal City of Comfortio, now capitol of Italy was founded. If you are interested in touring Wembley Stadium, information can be found at the majestically named Venue of Legends website. 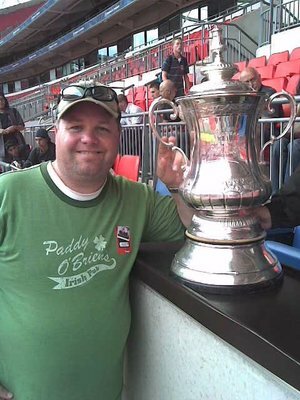 For £15 you'll get to see the the door leading to David Beckman's box, what the view looks like from the top level, the dressing rooms, the pitch, the royal box and you'll get to snap a picture with this replica of the FA cup. 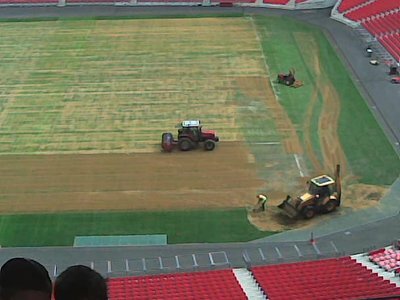 If no interesting events are going on while you are visiting, you might even get to see them re-seeding the grass of the pitch. They do have the largest Hindu temple outside of India (I should check that out) and a ton of curry restaurants. The Londonist blog has an entry on the story of The Borough of Brent's possible name change, along with a link to a news report stating that Boris Johnson, Mayor of London is contemplating unearthing a number of rivers that have been buried underground, including Brent. So, on one had we have the council of the Borough moving to new offices near Wembley Stadium in the town of Wembley, and on the other hand we have the re-emergence of the Brent River from it's underground concrete path. Hmmm, interesting times! Have you developed an accent yet? Not yet, but Madonna's got quite a head start on me, and now that she and Guy are on the outs and she is rumoured to be expanding her New York apartment, maybe I'll have some time to catch up and get an annoyingly fake British accent like she has! That'll be great. My London friend says I sound like Mary Poppins when I try to speak with an accent. Maybe you'll sound like cheeky Cockney chimney-sweep Burt.